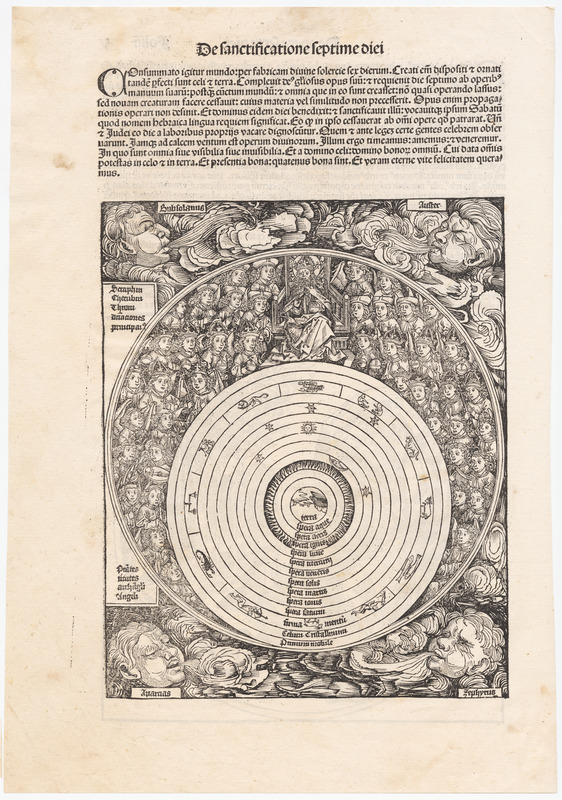 The collection includes three cosmological maps of the universe on the geocentric model: ID #1002.01, from the Nuremberg Chronicle (1493); ID #1005, from an edition of Virgil (1552); and ID 1018, from a Mallet atlas (1719). All three support the Christian view of the sun revolving around the earth, although the Mallet version was published more than 170 years after Copernicus' De revolutionibus and more than 80 years after Galileo's Dialogo. This diagram from the Nuremberg Chronicle is "the last and most spectacular in a series of seven. It shows God resting after creating the world in six days. This is a Christian-Aristotelian view of the cosmos: at the center is the earth surrounded by other three elements of water, air and fire. Beyond it are the seven planetary spheres (the Moon, Mercury, Venus, the Sun, Mars, Jupiter and Saturn), then the firmament (the dome of fixed stars), the crystalline heaven and Aristotle's primum mobile, the revolving outermost sphere which moves the universe by imparting motion to the other spheres. God on His throne oversees the scene, surrounded by the angelic hierrchy, also listed at the left. The four winds grace the corners." Helman 2013, 41. The impact of this image is not in the cosmological geography, right or wrong, but in the majesty of God resting in His work. See Notes and other information for ID #1002.03, Nuremberg Chronicle World Map. Albrecht Durer was apprenticing with Pleydenwurff and Wolgemut and likely contributed to the illustrations. Wilson 1976, 195-205. Schedel, Hartmann. 1496. Liber Chronicarum. Nuremberg: Anton Koberger, for Sebald Schreyer and Sebastian Kammermeister.